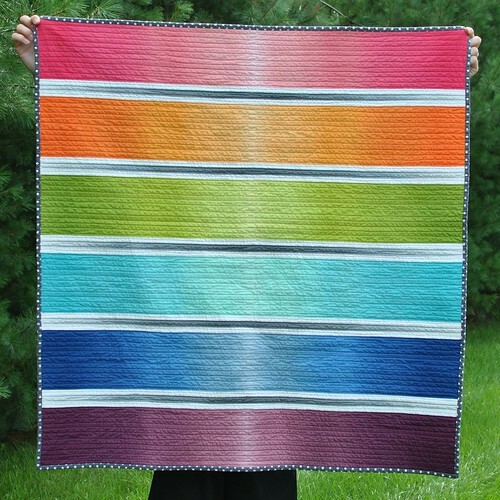 I started this quilt almost immediately after buying the jelly roll. I was so excited to play with these fun fabrics! The ombre effect lends itself well to just about any modern design you could think up, but I went with a simple rainbow. I felt a bit silly sewing the jelly roll strips back together, but yardage isn't available for this collection quite yet so I made do with what I had on hand! Once I had my color blocks sewn together I played with placement. 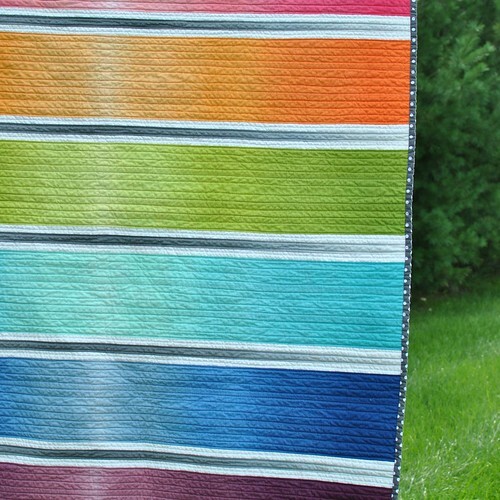 I ultimately decided on placing them in rainbow order separated by thin white strips of kona and a thin strip of the grey ombre. I pieced the grey ombre so that the colors faded outward in contrast to the color blocks, which fade towards the center of the quilt. Once I had that layout on the design wall I KNEW that I had to keep that element. 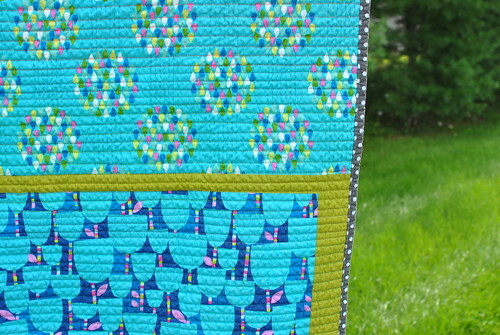 It adds so much movement to the quilt! For the quilting, I went with simple straight lines and I changed my thread color to blend with the background. 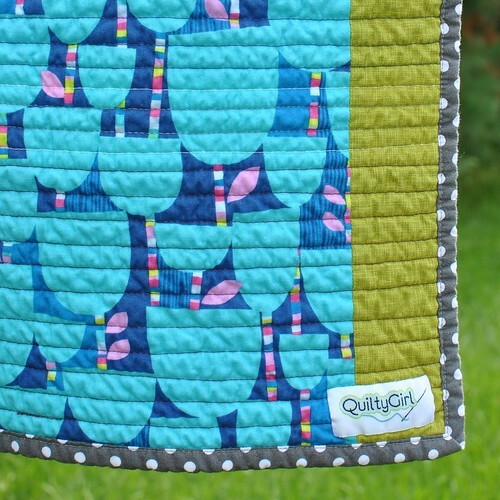 I really like that the ombre effect in the fabric means that the quilting lines fade in and out just as the fabric does! That also meant that I could simply pull threads from my stash - I easily had thread to match some part of each color block! For the backing I dug into my stash (yay!) and used up the last of my blue raindrops and blue flowers. I was a bit short on each print, so I added some Quilter's Linen. I love this green color! 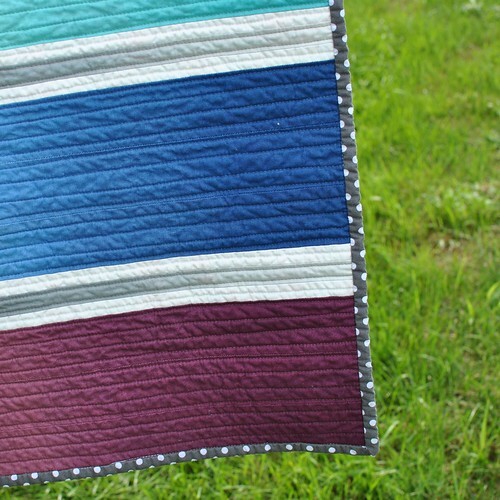 A grey polka dot binding finishes this quilt off, and ties in so well with the grey ombre strips! 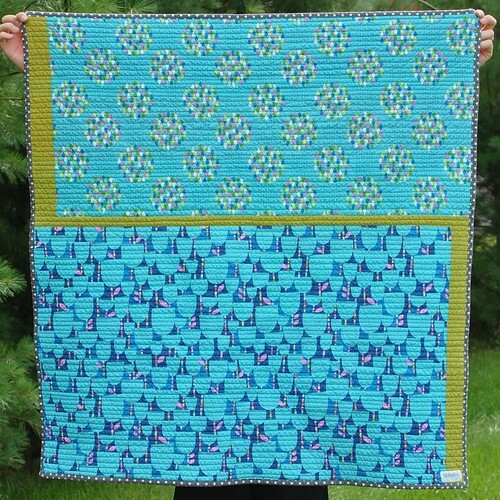 Finished size: 40" x 42"
Quilt is now listed in the Shop!